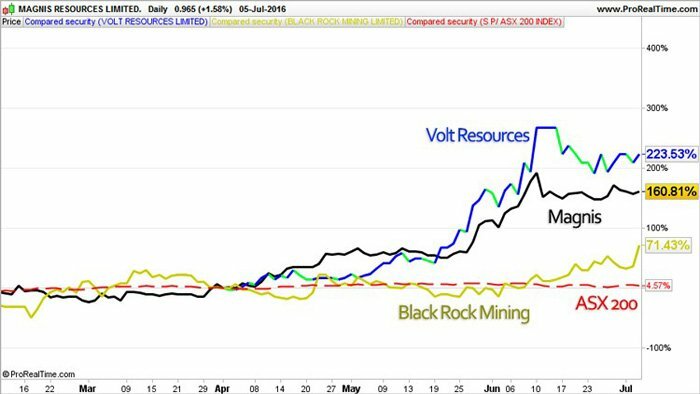 The last time we featured graphite explorer Black Rock Mining (ASX:BKT) on Catalyst Hunter it was just days away from its Scoping Study – which it duly delivered on. Naturally the next step in the chain is the Pre-Feasibility Study (PFS), which could be just a matter of weeks away now. Given what it’s done to date, having hitched its wagon to the graphite train, a PFS from BKT would make pretty good reading, especially in light of the current investor focus on Tanzanian graphite stocks such as Magnis Resources (ASX:MNS) and Volt Resources (ASX:VRC). BKT is currently capped at around $19M – trading at many multiples below its Tanzanian graphite peers – VRC is currently capped at around $100M, and MNS is current capped at $413M. However before we go too far, it should be noted that BKT is a very high risk stock, owing to the project location of Tanzania. Getting mining projects off the ground here is not always easy due to political and social reasons. With a PFS a matter of weeks away now for BKT, it may be time for this stock to march upward closer toward its Tanzanian graphite peers. Recent metallurgical test results show 99% TGC purities achieved at Ulanzi and Epanko North at the Mahenge Project from BKT’s ongoing optimisation program. The metallurgical team has surpassed 99% concentrate purity through relatively straightforward adjustments to the flowsheet. As you can see the results are solid and set BKT up for its coming catalyst – the release of its PFS. The entire +75 to +300 micron portion of flake graphite is achieving average 99% TGC purity for primary mineralised zones, representing 82% of the sample by weight. BKT believes that over the next test phase there is scope to further improve the concentrate purities. Considering graphite is gaining a lot of attention in the broader market thanks to increasing use of the material in next-gen applications, and for its use in lithium-ion batteries, BKT’s results look the goods when it comes to satisfying potential customers. Thanks to the drilling done to date at the Mahenge project, at last count the project had a total of 131.1 million tonnes of graphitic ore at an average grade of 7.9%. This equates to roughly 10.4Mt of contained graphite. Not bad for a company still capped at just under $20 million. The following table shows a comparison of tonnes of contained graphite vs market cap, and it’s clear that BKT could be catching up to its peers as it finalises its PFS. About 40% of BKT’s resource is in the Indicated category rather than the Inferred category. We’ve seen plenty of miners in our time crowing about massive numbers only to find that it’s 100% in the Inferred category, suffice to say Indicated has more impact. Above is the overall location of the project, about 60km by rail link to Dar es Salaam, and also within earshot of major export port Mtwara. Crucially, it also has the potential to access mains power from a nearby hydroelectric plant – a vital element in getting mining projects up and running in Africa. As we have seen above, BKT isn’t the only Australian graphite explorer in the neighbourhood, with ASX powerhouse MNS next door as well. MNS is further down the track from BKT in terms of project development, and has wound its way to a market cap of over $400 million. The question all investors looking at BKT are asking is can BKT end up somewhere in the same ballpark within a couple of years? All the ingredients are in play here – now it’s just up to BKT to make the numbers work so it can take the offer to a major funder, and then it’s well and truly off to the races here. The last time BKT was featured here on Catalyst Hunter we were looking ahead to BKT’s Scoping Study – so it’s probably a good idea to get a grip on what it hit the market with as we look ahead to the PFS. The baseline is that BKT has opted for a smaller-scale operation in order to maintain the financial integrity of the company and do something achievable. It finished work on a 52,000 tonne per annum scoping study, one that provides a two year payback period and has an internal rate of return of 62%. A lot of mining companies will try to build the biggest thing as quickly as possible and stretch themselves incredibly thin in doing so. It’s what happened when Napoleon and subsequently Hitler tried to invade Russia. They stretched their supply lines way too thin trying to go after the big fish and it proved to be the downfall of their empires. It is wise then for a small company such as BKT to start out boutique and scale up over time. Here’s a quick rundown of the numbers from the Scoping Study. As you can see, it’s starting small with a 52,000 p.a production set up, that will allow a throughput of 500,000 tpa. Given the near-surface and coarse nature of the graphite at BKT’s project, there’s scope there to avoid a lot of upfront capital and potential debt by keeping things simple – The KISS principle applies. 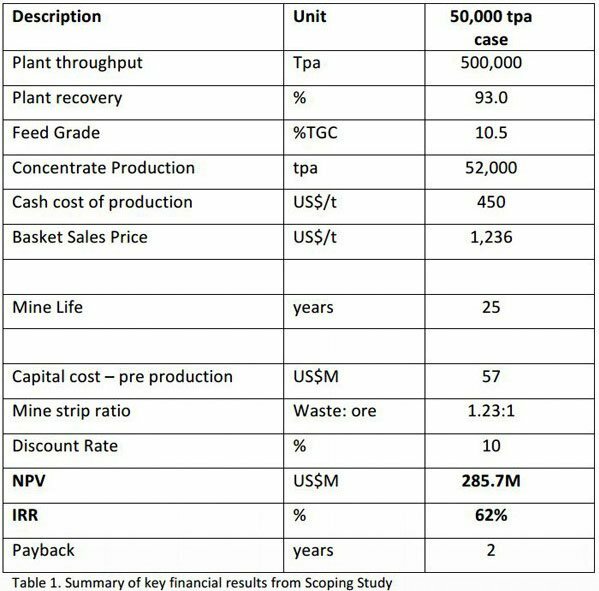 The project has cash costs of $US458/t ($A623) with a sales price of $1236/t – although the sales figure in particular does have scope to change over time – the graphite market can fluctuate. Thanks to keeping things small and going with a 50,000 tpa plant option, the project has pre-production capex of just over $57 million – certainly within the grasp of a revolving line of credit – especially if it’s able to take a two-year payback period to the bank. Given banks give out loans over 20 year terms all the time to ordinary punters, we’re willing to bet BKT could find one to extend a two-year line of credit at the very least. BKT, however, has previously said that as part of the PFS process it may look to see if it can crunch the numbers on a larger plant to see if can make the numbers work there as well. So, what will go into the PFS which wasn’t necessarily included in the Scoping Study? The first thing to look out for is any further drilling BKT has done to further define its resource. When releasing its Scoping Study, BKT said it would aim to conduct infill drilling at its Ulanzi prospect to move further Inferred resources into the Indicated category – making the already impressive Indicated/Inferred ratio even better. It is also planning to drill the Cascades structure, so there could be an addition to the Indicated Resource there as well. Also of interest is its latest testing around graphite from its Ulanzi structure. 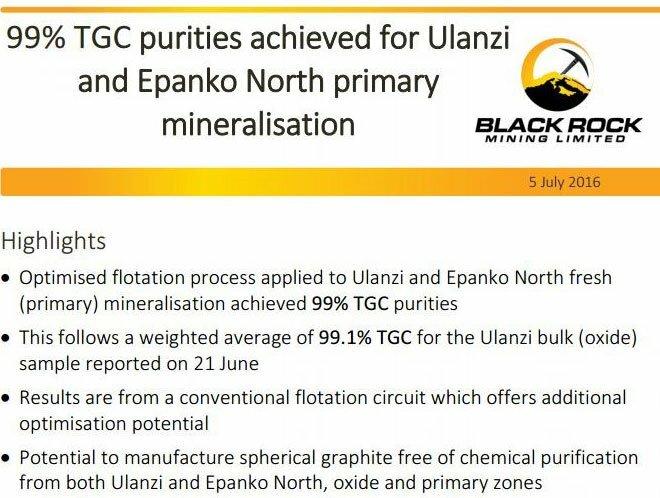 Most recently it managed to achieve 99.1% total graphitic content purity out of a bulk sample from Ulanzi. Better yet, it managed to achieve 99.2% TGC for flakes with 180 and 300 parts per million microns – which amounted for about 53% of the total concentrate. This means that more than half of the concentrate is ultra-high in purity. Just as a quick re-fresher – the higher the purity the less time and energy needed to strip out impurities, which then leads to better outcomes for both BKT and potential customers. Better yet, BKT said it hit the 99.1% TGC mark using a “straightforward processing circuit whilst preserving flake size”. Customers right now love big flake sizes in concentrate. Again, this makes it easier to separate from the concentrate when the customer gets it in the final form. Meanwhile, spherical graphite testwork is underway in Europe to determine whether Mahenge graphite could be used in battery applications. Should this come off and BKT secure an offtake partner, then all bets are off for this sub-$20M capped stock. At the same time, investors are reminded that success is no guarantee for BKT – this is a high risk stock. Caution is advised and it is always recommended investors seek professional advice before choosing to invest. It will be fascinating to see what effect the test work will have when it comes to crunching the PFS numbers. To what extent will additional testing add to the ability of BKT to scale up? The PFS is the next logical step for BKT to take on its journey towards being one of a clutch of companies looking at graphite in Tanzania right now. 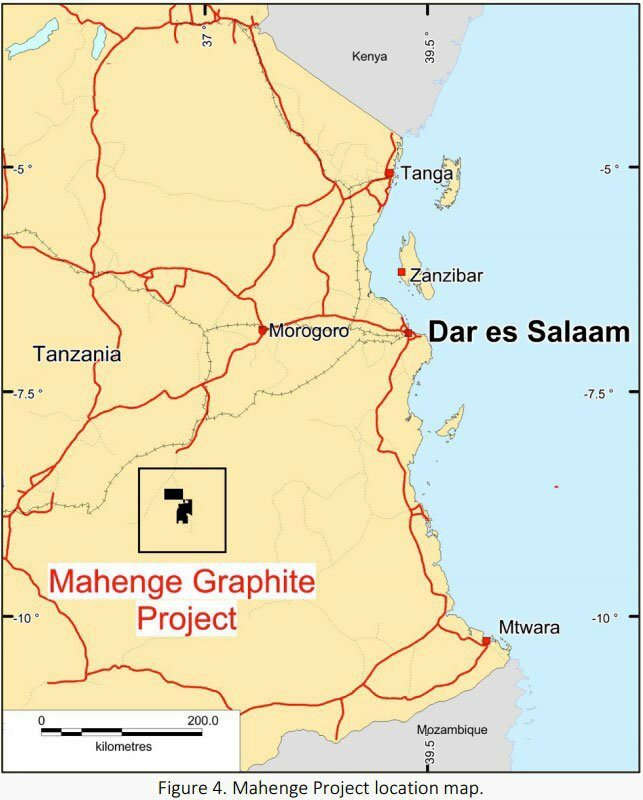 Despite the inherent political and social risks, Tanzania is shaping up as one of the company makers in the graphite game. Just take MNS for instance – it’s a stock we keep coming back to, as it shines the light on where BKT could one day take itself. In merely two years, MNS has risen by over 560% (at the time of writing) as it moved through the stages of developing its project. MNS’ success does demonstrate the sort of path Tanzanian graphite plays can tread if they get everything right. BKT is about to take the next step on its journey. BKT has already outlined a project with an IRR of 62% – and this is for a project on the smaller side. It will be interesting to see if, or to what extent, the PFS represents a scaling up in ambition for BKT. We get the impression the market is just waiting for a PFS to get a gauge BKT’s ambitions. The PFS will be the first look at whether BKT wants to keep things small and manageable or go for a big fish. In any case, it’s certainly shaping up as a catalyst moment.